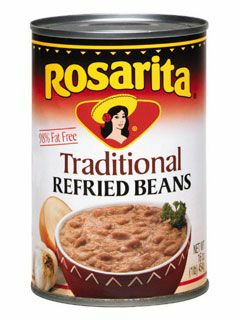 Refried beans or frijoles refritos are dried beans cooked, mashed and then fried in lard or oil with various seasonings including onions, salt and pepper. For over 50 years, Rosarita has been delighting families with authentic Mexican-style refried beans perfect for morning, noon or night. Using only the highest quality beans available, Rosarita comes in a variety of flavors — Authentic Homestyle Flavor, Traditional, No Fat Zesty Salsa, No Fat Traditional, No Fat Green Chili and Lime, Spicy Jalapeño, Vegetarian and Low Fat Black Bean. Rosarita is a Conagra Mexican food brand. Frijoles pintos refritos Rosarita. Frijoles Refritos Tradicionales. La forma tradicional de hacer los frijoles refritos consiste en freír la cebolla en el aceite, agregar los frijoles, dejar que se frían mientras se van machacando, hasta que estén chinitos, moviendo para que no se quemen. Se forma un rollito con los frijoles en el sartén y ya estan. Can't find these where I live. I was raised on Rosarita refrieds. I have tried other brands and they were good,but I want Rosarita. ConsCan only afford to purchase when I get a "free shipping" offer. These beans are very authentic and delicious. Our family has always loved Rosarita Refried Beans. They have an authentic taste compared to other brands. Our dishes taste so much better when we use Rosarita. Glad we were able to purchase the beans from Mexgrocer.com since we are unable to find in our local grocery stores. Thank you Mexgrocer!